Why don't you spend the day investigating how ready you are for IPv6 (you WILL have to embrace it sooner rather than later) and take part in the 24 hour "test flight" being offered by some of the big organisations like Google, Facebook and Yahoo!. 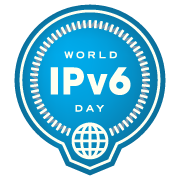 You can find more details on taking part and testing at http://worldipv6day.org/. I'm eager to take part and actually start using IPv6, but sadly my ISP seems dead keen on living in the dark ages and doesn't seem to want to offer IPv6 to its customers just yet.